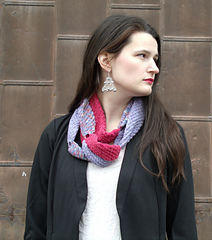 This pattern is both a complete pattern and a basic recipe to help you create your own unique cowl. 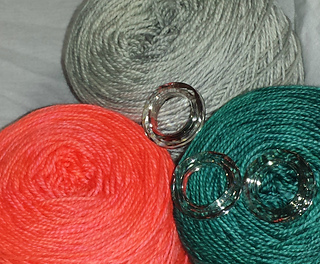 Use any yarn, yes really any pretty string that is also the correct weight for your rings. Choose a gauge that produces a fabric that you like. Specific directions are given for the three styles shown. I will be running a KAL in my Blackberry Knits group beginning April 8th 2015 and run until May 13th . I will be working a 4th version in the Madelinetosh Tosh Sock pictured in the 3 balls to the left during the KAL. Everyone who posts a finished project page picture will be entered to win the entire Dihiryn Mawr ebook. Ellen at Earthfaire found some amazing rings by Swarovski and will be offering kits in Tosh Shock. We have also chosen a few other special yarns that work very well with this stitch pattern as well. Any yarn Worsted or lighter will work with. If you have very large rings or bracelets any yarn weight will work. Double point needles are much easier for knitters who are not as experienced with magic loop. Magic loop will only work if you are experienced. You will only need to use double point needles for the first few rows after casting on the rings. US size 10.5 double point needles. US size 7 double point needles. US Size 7 needles needles. I purchased the dorset rings from Henrysbuttons. The kits from Earthfaire will include 3 crystal rings, this will be for the KAL knit. You will either create a single long cowl with 3 rings in any combination of 1-3 colors, or 3 individual cowls with 1 ring each in any combination of 1-3 colors. 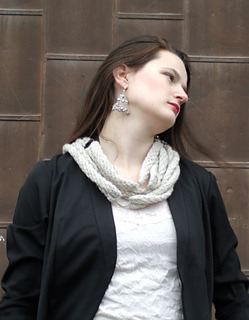 Specific instructions for cast on, knit and bind off are provided in the pattern, guidance on how to choose and how to create your custom cowl will be available during the KAL.